Our Oak Forest Center is conveniently located adjacent to I-57 between 167th Street, Cicero Avenue, and Crawford Avenue/Pulaski Road. Nestled alongside our businesses and industry partners OFC offers supportive cohort learning to area residents and is a great place to try out SSC with a FREE class (for those that qualify). PACE Route 354 – Harvey-Oak Forest Loop – Provides weekday and Saturday, circular loop service from the Harvey Transportation Center on 147th St, Cicero, 167th St, Dixie and 154th St through Harvey, Dixmoor, Posen, Midlothian, Oak Forest, Country Club Hills, Hazel Crest and Markham. 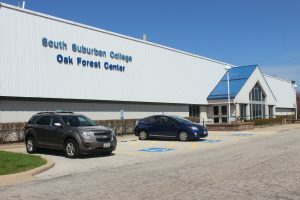 Route provides direct service to South Suburban College’s Oak Forest Center, Markham Courthouse and Pace South Division.